Located just 150 metres from the Musée d'Orsay, this 3-star hotel is set in a 17th-century building. It has a 24-hour reception and free Wi-Fi is provided in the soundproofed rooms. Each room is individually decorated and features Impressionist paintings. Satellite TV and facilities for making hot drinks are included in every room. A buffet breakfast is served in the vaulted breakfast room, and you can enjoy a drink in the bar at Hotel Bersolys Saint-Germain. The Louvre Museum is a 15-minute walk from the hotel and the Botanic Gardens are 700 metres away. Rue du Bac Metro Station is 550 metres away, providing access to the Montparnasse district. This suite consists of 2 separate rooms and 2 bathrooms. Extra features include a free WiFi, a fridge, a flat-screen TV and an electric kettle. The bed configuration can be changed to best accommodate your needs upon prior request. Free Wi-Fi, satellite TV and facilities for making hot drinks are provided in this room. Free Wi-Fi, satellite TV and facilities for making hot drinks are provided in this room. This room can accommodate 2 adults and 1 child under 18 years. Free Wi-Fi, satellite TV and facilities for making hot drinks are provided in this room. 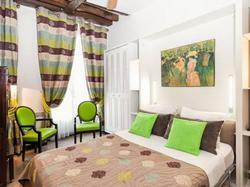 Please note that this room can accommodate 1 child under 18 years old at an extra charge of EUR 30 per night.